I’ve written before how I see images sometimes. Evenings spent in the yard with the kid, singing on the front porch with friends, making music at my own leisure after a day spent caring for Nathan. I have images of the past, sometimes separated from much of their context, which is generally jumbled & sometimes tense with fear. I know that the images I see of the future will also have context, sometimes good, sometimes fearful, sometimes confused. But the images will happen, just as they’ve happened in the past 4 years we’ve been in New York. A bad context doesn’t ruin a good moment, and those moments are worth reaching for. The moment of seeing a copy of my first album in my own hands was one I worked for long & hard, & I’m still proud to hold it today. It sounds kinda goofy, but I sometimes pause in wonderment before placing a copy in an envelope for someone, & I just look at it, reading the liner notes & being thankful that I can now have as many of those moments as I want. The same is true of holding Wifely, one of the only choices I ever made perfectly. So although I know that the next 20 or so years will bring hardship, confusion, & tough decisions, I also know that it will contain moments that are worth any pain required to make them happen. I had originally planned on bringing my life to a point where it would be one long series of those moments. But it was not to be, and I must steal those moments when I can. It may be that this very outlook could allow me to experience more joy in those moments than I ever have before. I never knew how to linger in a moment during my twenties. Every moment was expendable in the face of a greater moment, sure to be just around the next corner. The next interminably long corner. Actually, I think I understood a little better during my first year of college. My usual self-imposed demand for results was on hold somewhat while I waited for my other band members to get out of high school (they were two years my junior), and that allowed me to give myself license to smell the flowers a bit. Fridays were the best. With no classes, I would pick a spot on the map, pop in a cassette, & drive for hours. No hurry to be anywhere, just enjoying the moments. As with today, there were occasional tugs from my work ethic, telling me something had to be done, but the place I was in my life gave me latitude to send such thoughts away. The end of that was probably the band breaking up before the guys even made it out of school, coupled with a new job that required me to work on Fridays. Getting hooked up with a new band & seeing the uselessness of college for me, I could no longer spare a moment to dawdle. It was time to bring my future about. The internal biographer would have been rather surprised at the decade which was to follow, and indeed has been frantically rewriting pages ever since. I’ve tried to silence him, but the best I’ve been able to do is get him to withhold any judgments till I’m 60. During that time, I’m allowing myself to create moments of joy wherever I can. New albums in my hand, evenings with those I love most, and days spent picking spots on the map with the little one. My 4 years in NYC have taught me about enjoying the scenery. It’s a lesson I learned in college, but after 12 years in the wilderness, I needed a refresher course. Here’s to all tomorrow’s Fridays. This is my last day living in New York. I’ve been thinking that after this Friday, what little physical evidence of my residency here will be gone. On paper, digital records, & in the memories of those I’ve encountered, there is evidence enough, but no longer physical. Soon the last of my garbage will be removed to parts unknown. Any cells I’ve shed in the shower will join atoms in the sea. The New York air once in my lungs will rise to meet the atmosphere. Soon the rain will wash the last of my footprints away, and any trace that I’ve ever been in this great city will be anecdotal. The city won’t stop to mourn, indeed every day at least one new pair of footprints sets down to claim their place here, and one of them will claim mine. My MetroCard will no longer swipe through the turnstiles at the Fort Hamilton Parkway subway station. I will not sit in the small end seat on the M train. But I won’t be missed. I didn’t miss the poor schlub who sat there before me, and whose whereabouts it is impossible to know. If I had built a monument, maybe, or even a house, but no. Not me, scribbling thoughts among the chaos above and below the ground, where nothing ever really stops, but goes on as it has for decades, even centuries here. I wish the train could remember my name. But what of that, when at last it reaches the end of its own residency here, and is taken to the ocean to begin a new life as a coral reef? Its physical presence will then be legend, too. There’s something missing in this kind of thinking, though, and it didn’t occur to me until I looked at my son. He now weighs 15 pounds, 5 pounds more than he did when he ceased being a part of my wife’s internal food distribution process and came out into the world to be his own person. What accounts for those 5 pounds? Well, the only thing that’s been added to his internal body chemistry has been formula. Powdered milk product, inanimate and sitting in a can at the local grocery store. But it is now him. It’s not just in him, it IS him. When he points to himself one day and says, “I’m Nathan,” part of what he’s pointing to will once have been inanimate mass. The same is true of me. For 4 years, I have eaten, drank, and breathed this city in. Bagels from the Hanover Deli, shishkabobs from Tommy’s cart on Pearl Street, pizza from A.J.’s in Borough Park. Part of me was once the city. Once it entered my body, did it cease to be a piece of the mass that is New York City? I don’t think so, because part of that mass is its people. NYC’s residents constantly exchange mass with their surroundings, from dropping hairs on the sidewalk to breathing soot from taxicabs. One requires the other, or the city does not exist. We’re told that human cells cycle out every 7 years, so that at the end of that time, your body is technically a completely different one than it was 7 years ago. Given the above illustration that we are what we eat, it can be reasonably concluded that for the next 7 years, the physical evidence that I once resided in this city will exist in me. My body is, in part, the city. I will take it with me, and will give some of it to every other place I may go during that time. After that 7 years is up, what happens? I will technically be a new me, but of course the brain is the records clerk which keeps us from forgetting who we used to be. And given my family’s traditionally long lifespan, the anecdotal evidence contained therein may well outlive any that survives in some New York file cabinet. So at the end of it all, the point remains that although the city will forget me, I will not forget the city. I will not forget that for a brief time, we were merged, and gave each other what we could. In whatever small ways, neither of us can ever be the same. Given our hasty retreat from the Big Apple, some readers may wonder if I now consider moving to NYC a mistake. Quite the contrary. Traditional science says that a truth should be true regardless of when and where it occurs. For instance: matthew is better off in New York City. Period. Dynamic Systems suggests that truths change depending on what time and place they occur in. 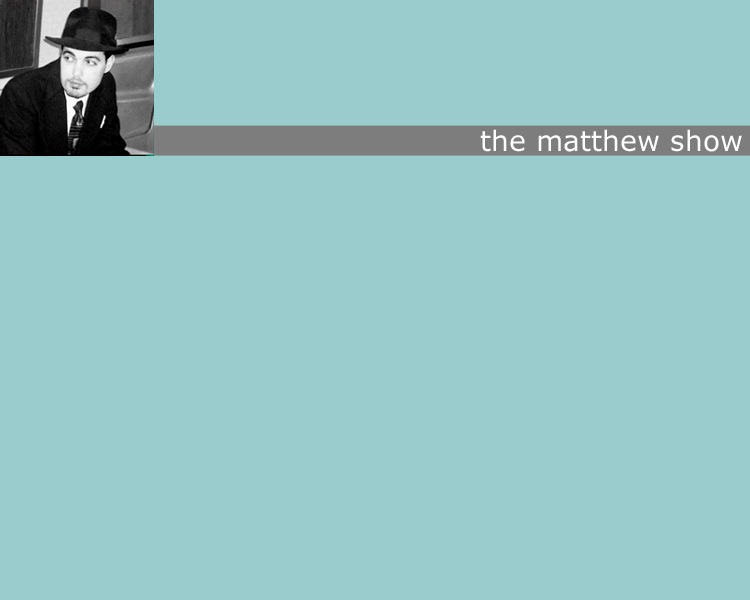 Thus: In 2002, in Texas, matthew is better off in New York City. In 2006, in New York City, matthew is better off in Texas. Both statements are true. The matthew in question may appear to be the same entity (though see above for partial refutation), but time and space have altered the truth of where he belongs. As it turns out, humans have some strange ideas regarding where they are anyway. Someone may say that up is up and down is down. That statement is demonstrably false. To an Australian, up is the entirely opposite direction to up for an American. And even that changes from moment to moment. We may sit in a chair and believe that we are perfectly still. In fact, we are rotating around the Earth at thousands of miles per hour. Not only that, but we are revolving around the sun, often in a different direction, at thousands of miles per hour. And we’re moving around the Milky Way, in an even different direction, at thousands of miles per hour. AND the Milky Way is moving towards Andromeda, again in a completely different direction, at well over thousands of miles per hour. If you believe that if you sit in your chair for two minutes, you are in the exact same place you were two minutes ago, you are sorely mistaken. It would be like sitting in your car and believing that though you’d just driven from Miami to Anchorage, you had not moved because you were still in the same seat. To complicate matters, we are moving through time, a mathematically proven fourth dimension, at the speed of light. It makes sense that this is the highest speed we achieve, because when sitting in a chair, it’s the only direction we can feel ourselves moving forward in. All of this is to say that moving to Texas 4 years after coming to New York is not really moving back to the same place. I can see that by driving down South Main Street in Weatherford. Many familiar sights, yes, but it’s certainly not the same place. “You can’t go home again” is a common and worn-out phrase, but all the facts stated above make it scientifically provable. That said, what’s yours is yours. The chair you sit in is the state of the matter contained therein for as long as you or forces beyond your control choose to keep it so. The house you live in will occupy the same place relative to all other places on this planet for as long as you or outside circumstances let it. Finding such fixed objects is an adaptation that helps keep us from going seasick with all the constant motion we are subjected to throughout our lives. New York is more like the rest of the universe than most cities. Its motion is like that of the planets, quick and unyielding. The forces that drive it forward number in the millions, and keeping track of them all is a task impossible for the human mind. There are those who try, though. Many lifelong New Yorkers practice the art of surfing the waves of change that surge through the city day after day. They find pockets that seem untouched by these forces, but in the end, all will succumb, and a new haven will be found. The city teems with stories of how things used to be, in Williamsburg, on the Lower East Side, in the South Bronx. What is never is for very long. Knowing this, I remain fascinated to watch people claim places in New York as their own. I marvel at their sense of belonging to a place that cannot possibly belong to them throughout their lives. Near our old Manhattan residence, there is a plaque on the side of a nondescript apartment building. It was dedicated to the memory of someone dubbed Saint Agnes of Clinton, a woman who lived in the front ground floor room for many decades until the mid-1980s, and was apparently loved by her neighbors enough to warrant a brass marker in her honor. I don’t know whether that story makes me happy or sad. I suppose there’s the Mr. Holland’s Opus and It’s A Wonderful Life lesson, which is that a seemingly obscure life did in fact make an impression on its surroundings. But knowing Midtown Manhattan like I do, I’m aware of how transitory those surroundings are, and thus I suspect that the memory of such an impression is probably not tied to the place so much as the people who were on that block at that time, many of whom have likely moved on to somewhere else. So I wonder if in fact a person can ever belong to a place. Places forget. It’s people who remember, long after the place is no longer the same place they left. In the movie Garden State, Zach Braff wonders if a family is a group of people who miss the same imaginary place. I would say that that defines New Yorkers to a T. Thus, all 8 million people who have shared this city with me for the past 4 years are in some way my family. For the rest of our lives, we will remember a place that no longer exists, save for in our brains. It will be a ghost, one that will linger in this world until the last of us dies and takes it with us into oblivion. And of course the city itself will one day be a husk, blown dry and lifeless by a sun gone red giant and a planet left to spin itself through space alone in the dark until one day its atoms, which may still contain traces of what once was me, will collide with those of Andromeda, and become whatever they will become. Complex as this may sound, it is how I’ve come to think of my time on this Earth, and consequently my time in New York City. It is what it has been, which is an experience I’m glad to have undergone. I am now convinced, if I wasn’t before, that New York is where you go to find out what you truly need, want, and what you can do without. Those who dare pass through take that knowledge with them and use it for the rest of their lives. But these things make New York more a force than a place. The experience of living here is akin to being struck by lightning. The specific blast of energy that struck you will never occur again, but one can never really be the same afterwards. It’s a force I needed to weather, and I am the better for it. Goodbye, New York. It was nice seeing you and nice being you. We both move on, changed, yet only the two of us will really ever know how.